A trip to the farmers market recently yielded a wonderful delight. Some of the most beautiful squash blossoms. Whenever I see a squash blossom I always think of a beautiful delicate flower, yet so many of the dishes for squash blossom call for them to be stuffed or deep-fried. With all the wonderful fresh vegetables out there right now, we (my sister and I) decided to embrace our local produce haul for the week and make a vegetable pasta dish with a little bit of bacon thrown in for my nephew, because everything is better with bacon. Below is the recipe we threw together, but feel free to follow your own bliss. 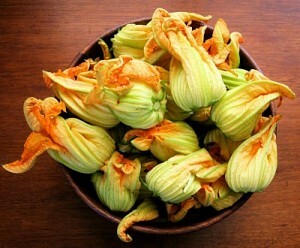 Just remember, the squash blossom is a delicately flavored flower, so this one time hold back a little on the spice. « Bacon Wrapped Apricot Shrimp – Yes, please!